It took me quite a long time until finally this mini turned out to my satisfaction. 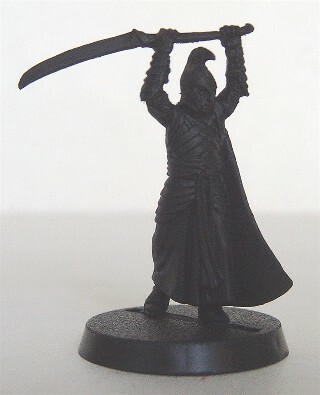 My main problem with Highelves has always been the cloak! As far as I know GW used a mix of Chaos Black, Goblin Green and Chainmail to paint them, but that didn¡¦t really work for me. Still I wanted to achieve a kind of metallic look on these coats. 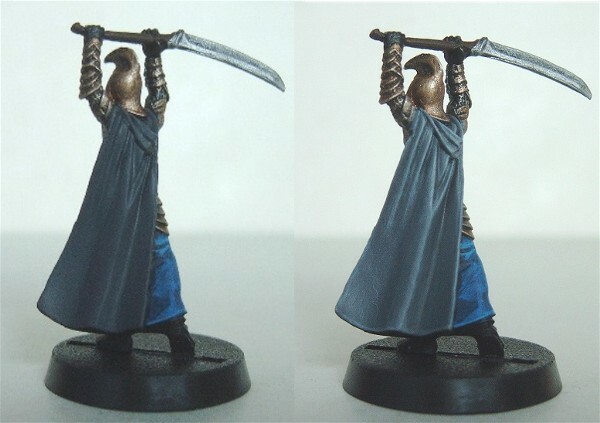 Then, a couple of days ago, inspired by Gandalf-Grahams excellent NMM guide on his homepage(non-metallic metals = painting metallic items with non-metallic paints), I decided to use different greys to get a kind of silverish look. So in a way, this is my first attempt at painting NMM. It¡¦s up to you to decide weather it really worked or not, but either way I think it turned out quite nice. I hope this article will help and inspire both, beginners and expert painters. One more remark about dry- and wetbrushing in generall: In my opinion a lot of people, many of them even beeing experienced painters, often underestimate the potential of drybrushing. I have know quite a lot painters who, as soon as they mastered the basics of drybrushing, moved on to learn the more advanced or difficult techniques. Now what I want to say is, that drybrushing and especially wetbrushing has a lot more to offer than many people think. And just like with every other painting technique, it will take you time and practise to use it to its full potential. Combined with other techniques, you can achieve incredible results (though I would not say, that I really master it yet). So don't think, it is just something you do when you're in a hurry, proper wetbrushing will usually take you some time. So don't waste anymore time and start by wetbrushing the entire armour and helmet with Chainmail followed by Mithril Silver. Now wetbrush with Dwarf Bronze, Shining Gold, followed by Burnished Gold and finally a 50:50 mix of Burnished Gold and Mithril Silver, until the whole armour has a very bright golden look. Wash the armour with thinned Chestnut Ink. 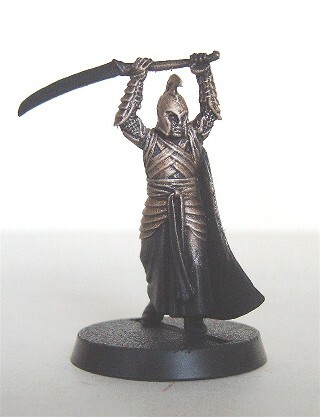 Carefully outline every plate of the armour with thinned Chaos Black. This will add some additional depth. 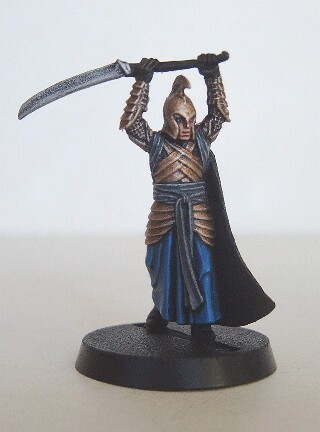 Again lightly wetbrush with the 50:50 Mix of Burnished Gold and Mithril Silver. In case the armour turns out too bright, again wash it with thinned Chestnut Ink until you have the desired end result. Now start painting the Sword by drybrushing the blade with Boltgun Metal, followed by Chainmail and finally a light drybrush with Mithril Silver. Wash with thinned Black Ink. Repaint all the parts of the miniature which have been accidentally drybrushed (face, skirt etc.) with Chaos Black. Base the skirt with an 80:20 Mix of Chaos Black (80%) and Regal Blue (20%). 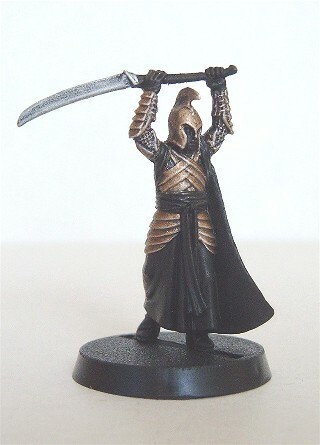 Leave very thin lines of Chaos Black between the skirt and the other part of the model like the armour, the belts etc. Now highlight with Regal Blue, followed by a 50:50 Mix of Regal Blue and Enchanted Blue, pure Enchanted Blue and finally an 80:20 Mix of Enchanted Blue and Ice Blue. For each layer, water down the paints to slowly build up the highlights. Start by painting the eye balls with Skull White and then paint the pupils with two very thin black lines right in the middle of the eyes. Use a real good fine detail brush for this (size 0000), makes life so much easier! Now base the rest of the face around the eyes with Dark Flesh. Then highlight with Dwarf Flesh, a 50:50 Mix of Dwarf Flesh and Elf Flesh and finally highlight the nose, the cheeks and the chin with pure Elf Flesh. Base the sashes and the tunic with a 50:50 Mix of Chaos Black and Codex Grey. 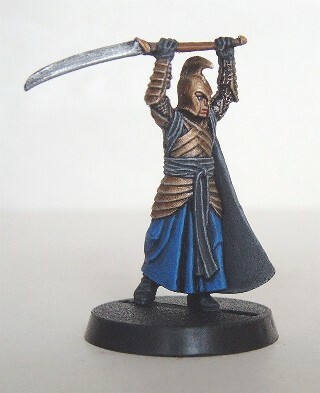 Now highlight both, the sashes and the tunic with a 20:80 Mix of Chaos Black and Codex Grey, followed by pure Codex Grey. Finally wetbrush with Fortress Grey and then Skull White to achieve a kind of silverish look. Simply drybrush the gloves and the boots with Codex Grey followed by Fortress Grey. Finally paint the sword hilt with Scorched Brown and highlight with Bestial Brown. Paint the entire base Dark Flesh, then brush thinned PVA adhesive onto it and dip the base into GW sand. When dry, wash the sand with pure Brown Ink, then drybrush with Snakebite Leather, a 50:50 Mix of Snakebite Leather and Fortress Grey and finally pure Fortress Grey. Now repaint the edge of the base with Dark Flesh again and add some different kinds of static grass to it. Thats it! 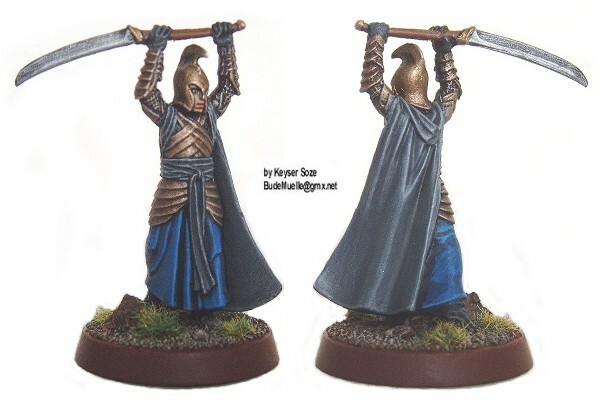 Another noble Noldor Warrior is ready to join the Last Alliance! I hope you enjoyed reading this article as much as I enjoyed writing it. Feedback and questions as always very much appreciated!